Consultation Digest Issue 22, 20 November 2018: A bumper bundle of new consultations. Over the last year some of our members led by Euan, Iain and Jim have been working very hard on a ‘Space for People’ @peoplebyresroad campaign based around the planned changes to Byres Road. They’ve just put out a really interesting blog illustrating connections within our current cycling network, with suggestions on how Byres Road can help start to create better connections locally and also throughout the wider city network. Have a read – it’s great – and if you like what you read give them a follow and a share. And thanks to you three for your excellent work. “Cycling is going to change the world. Er, hold on you say, that’s a bit much isn’t it? Well, it changed my world in the little part of it I started really using a bike to get around in, here in Glasgow, and I truly believe that that can extend to the rest of the world. When I first realised that through travelling by bike, I could ditch the crowded bus, avoid the congestion, yet get to work faster and still not have to go to the gym in the evenings, my opportunities and horizons were opened up and suddenly I’d grown wings. I no longer had to worry about travel timetables, I had the freedom to go wherever I wanted to, by whatever route I chose, and I could stop off wherever took my whim. And I saved so much money on travelling around the city that it meant I could buy even more bikes! Oh and there’s more, I was fitter, healthier, energised and happy in the knowledge that I wasn’t impacting on the environment. And my happiness was fed further by all these other wonderful people on bikes, who’d chat about the weather at traffic lights, encourage me at locking stands, and nod conspiratorial hellos when out on the road. Cycling has given me absolute freedom. I am aware though, that if you cycle in the West of Scotland you will know all of this, because these are the things that keep people here riding, because as you will also know, riding a bike here can often be really tough. The cycling infrastructure we have is few and far between, and the design and maintenance of what little we do have is decades behind the forward thinking cities in Europe. Our cycle paths tend to meander the long way round through back streets, taking us away from our desire lines of travel. What we need are direct routes if people are going to see cycling as a viable transport option. Direct routes such as the ill-fated and incomplete Bearsway that needed and failed to find brave political decisions to take space away from the motorist. We have a proliferation of shared use paths as the majority share of our cycling network. Shared use paths put people walking and cycling into conflict, they create confusion, they disappear as invisibly as they appear, and are simply not a good design for cycling speeds. Yet even now they are being built as standard into new infrastructure in areas like Govan Fastlink. Cycling around our networks, it is clear that very few of our paths join up, and we are often spat out with no consideration into busy roads. Some roads provide non-enforcable bike lanes in paint, often in the door zone, offering no protection and in many ways actually putting us in greater danger. Maintenance of the parts of the network we do have is given very low priority within our councils, where leaves can render some parts unusable during Autumn, ice, the same during Winter, and glass, potholes and parking are rife within our cycling spaces during the rest of the year. Our car-centric provision and attitudes can make folk on bikes feel very unwelcomed on our roads. Put in short, it’s not always pretty out there. But things are slowly improving, thanks in a large part to cycling campaigners in organisations such as GoBike who have given up their free time and put in masses of work and effort into fighting for cycling to be considered and for better design. It is starting to feel like our voices are being heard in parliament and by some forward thinking councillors, and even out on the roads I am starting to see a difference not only in the improved design of lanes such as the South West City Way, but in the number of cyclists out using them all year round. I’m so excited that one of my main commuting routes up Victoria Road is soon to become a segregated cycle lane. There are big plans afoot for more people friendly spaces all over the city, in Woodlands, Battlefield, Byres Road, Queen Margaret Drive, and many others. We have our hands full making sure that these plans have our needs properly met, but that’s a good thing, and it’s why we need your input. Already we have intrepid GoBike members out there working hard on mini-campaigns such as Space for People Byres Road, and Friends of the South City Way. This coming year we are going to need you all to get more involved and if you feel like you can be a part of our movement, you can help by joining our membership and having your head counted to make our voice more significant. 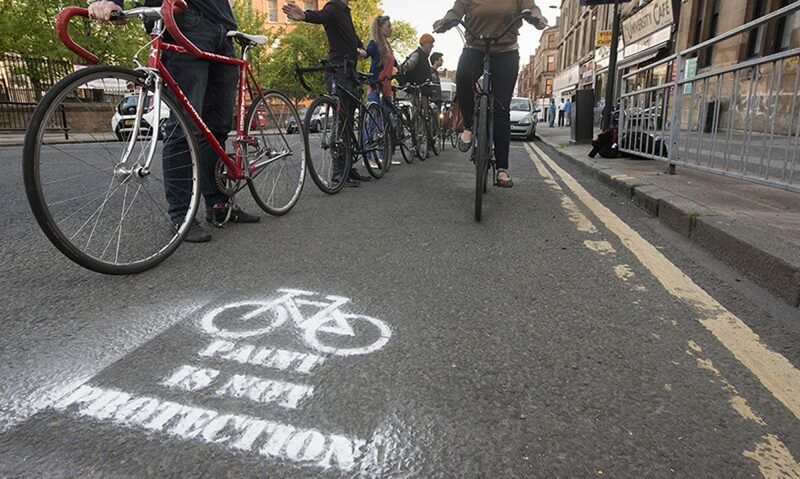 Get involved in our conversation on Slack (drop us an email expressing your interest), you can help us write to councillors, show them your local roads, respond to consultations, like and share our social media, write us a blog, tell your friends about us, and engage in some real world action like the Ride for a Better Byres Road. We’d also love to know what you would like to see from us, and how you think we can improve as a campaign. Let us know your feedback and ideas – both Dave and I can be reached on convenors at gobike dot org . It’s clear that these positive changes we are starting to see are going to take time to manifest onto our roads, and while that happens, people on bikes are facing challenges on a daily basis. I too face these daily challenges and that is a part of what gives me the push to want to fight harder to make the changes better and make them happen faster. I know that my co-convening sidekick Dave also faces similar regular challenges out on the road, and having already worked closely with him on projects like Pedal on Parliament, and Friends of Bearsway, I’ve seen how his energy, smart thinking and innovative approach can be of a huge benefit to pushing campaigns forward. I hope that by working together Dave and I can continue to lead GoBike forward as a force to be reckoned with. Many campaigners have campaigned for better cycle infrastructure, despite the political conditions, certainly not because of them! For many years the ‘political will’ has not existed for the changes required to bring active travel to the masses. Many politicians in the past have given short shrift to the idea of adjusting the balance of the environment, away from the motor vehicle and towards more sustainable transport. The car has very much been the king in Glasgow and the surrounding areas for many years with the M8 being the greatest monument to the cause. Despite a very unfavourable environment, campaign groups like GoBike have worked tirelessly over the years to try and improve the lot of those who chose alternative forms of transport. It’s been tough, and whilst the victories haven’t been widespread, there have been victories. When I helped to set up the Pedal on Parliament campaign back in 2012, I got a taste of that environment, having attended a meeting where a transport minister almost shouted at us for not praising his pitiful attempts at ‘driver education’, and another meeting where a Glasgow councillor stated that he would never set a percentage of the transport budget aside for active travel, as long as he was in post. However, even back in 2012, the environment was changing. The Times were actively campaigning for better infrastructure, City of Edinburgh Council were starting to talk about a big change in policy. The political environment was changing, all be it slowly. Fast forward to today and we find ourselves in a very different situation. We have an Environment Minister who not only talks a good game, but actually puts his money where his mouth is. We have the council in Edinburgh spending 10% of its transport budget on active travel, and we have a Glasgow council that actually rates active travel and the local environment high up on its priority list. Things are far from rosy of course. Edinburgh is still making significant design mistakes in its proposals, ‘Bikelash’ is a very real thing (I know this personally from East Dunbartonshire and Bears Way), and there are still areas where paint is seen as an adequate solution. However, the debate has well and truly moved on, with the vast majority of new cycle lane design proposals including segregated infrastructure. That just did not happen 10 years ago. The campaign discussion itself has also moved on, and more and more we are talking about ‘place’ and ‘people friendly’, rather than focusing on just the cycle infrastructure. It’s not about catering for cyclists, its about catering for people and enabling people to make their own decisions on which mode of transport suits a particular journey, and making sure that that mode is catered for. Personally I’ve been lucky with my timing. Pedal on Parliament was a great achievement and all of us involved should be proud of what we achieved, but that only happened because there were also improvements in the political environment. It also feels like I am lucky in my timing for being accepted as Co-Convener of GoBike along with Iona. Glasgow is in a great position to make big strides over the next few years. Those that came before us have not been so lucky. Thus, I think it is entirely appropriate to say that Iona and I, ‘stand on the shoulders of campaigning giants’. We are truly thankful to Tricia and all those who have been working hard in GoBike for many years, who have helped bring us to this point today. We must not, though, be complacent. As demonstrated in Bears Way, something I will be revisiting in the future, there will be trouble along the way and we must prepare for that. As well as being willing to criticise the bad, we must be willing to praise the good, and to help our politicians to make the difficult decisions. We must also understand that not every decision will be exactly what we want, and we must accept that there will be a compromise or two along the way. However, I am excited to be jointly at the helm of GoBike at what is undoubtedly an exciting time. I am particularly excited to be working with Iona, who I worked with in organising PoP Glasgow. Iona is full of fantastic ideas (far more then me!) and has the drive to take them forward. Along with Iona, and of course the rest of the GoBike team, I will strive to work with councillors and council officers to ensure that we get the best value for our money and the highest quality possible in Glasgow and the surrounding areas. I also aim to encourage more hyperlocal campaigns such as Friends of Bears Way, which will benefit from the backing of GoBike. How are we going to achieve this? With your help. GoBike is only as good as its membership, so if you care about anything I’ve written about above, join us. Join as a member , join the conversation on Slack (drop us an email at convenor at gobike dot org to ask for a Slack invite) and spread the word to cyclist and non-cyclist alike, that Glasgow has the potential to be so much greater than it is already. The great news is that Mark Ruskell MSP who has been working on the bill has now reached the threshold of support to take 20mph to vote, but he has let us know that if he can get a wider range of cross party support on it, it will make the bill proposal stronger when moving forward. So we still need your help! If you can ask your MSPs to sign up to the bill (particularly those from the Lib Dem and Scottish Conservatives Party of whom none have signed up so far) it could be a really significant help. The deadline is 19th December. GoBike was invited to give a short presentation on a campaigning theme at the Transform Scotland AGM 2017 held in Glasgow City Chambers on 26 October. We chose the topic of Contraflow Cycling and a summary of our talk is on the Contraflow Cycling campaign page on our website. Contraflow is essential in our towns and cities to make them permeable for bikes. One way streets were introduced to “improve” flow for cars, but this, as we know, has had the effect of increased vehicle speeds, increased vehicle use, increased congestion and increased pollution; we want our streets back. At the AGM Transform Scotland launched their Transform 20 campaign: ‘As part of Transform Scotland’s 20th anniversary year we’ve launched a new campaign called #Transform20. This campaign focuses on offering an easy way for the public to communicate their ideas to transform transport in Scotland to become more eco-friendly, safer and easier to access. GoBike has submitted our Contraflow campaign to this page, others have submitted their ideas too. Why not have a look and submit your bee-in-your-bonnet campaigning idea? If you like our Contraflow campaign please send in your contraflow picture, telling us where it is, to campaigning@gobike.org and we’ll add it to the web page. Last week we told you about the forthcoming West Glasgow School Run Summit, hosted by Dumbarton Road Corridor Environment Trust, that took place on 14 November. We are pleased to hear that the event was a success, see the press release that has been issued: 20171116_DRCET_SchoolRunSummit_PressRelease So let’s hope that we soon see more school runs by car becoming school runs by foot or bike! A positive outcome of the event is that Councillor Michael Cullen, for Garscadden/Scotstounhill, SNP, who attended the event, has now been in touch to say that he would like to cycle with us round his ward. We’ll be progressing that and, hopefully, we might get some of his ward colleagues along too.